Harley Vincent is resigned to life in the human world. Sure, being a margay shifter is half her nature, but life among humans gives her the freedom to roam and do as she pleases. That is, until anti-shifter extremists target her, putting her life in immediate danger. When an old acquaintance and onetime fling, Jesse Dalton, shows up to offer the protection of his pack, Harley hesitates. She may have feelings for Jesse that go beyond their one-night stand, but life among shifters means giving over her independence to the needs of pack. Plus Mercury Pack has its own threat to face: a rich half-shifter is determined to claim their territory at any cost. Jesse, who lost his true mate as a child, has wanted Harley since their night together, and he’s not letting her go again. They may not be destined for each other, but he knows she belongs to him and with his pack. Even if he can convince her to join him now, can he convince her to stay? 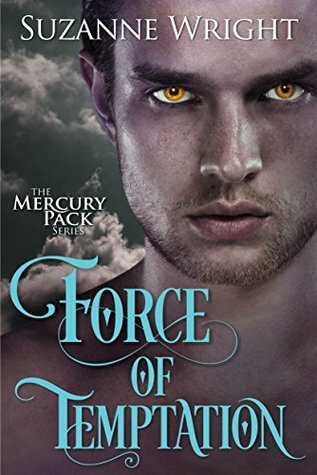 The Review: The Force of Temptation is book two is Suzanne Wright’s The Mercury Pack series and this time around the story is about enforcer Jesse Dalton finding his mate. However Jesse lost is true mate at a young age so he will never be able to find another true mate but there is a little margay shifter who he has claimed without her knowing it. Harley Vincent has moved from place to place after being unsafe in her current pride. Now living in California working in a club Harley doesn’t know that Jesse is days away from coming to claim what is his but when extremist target Harley, Jesse comes sooner than he planned and takes her under his packs protection. But can Jesse and Harley overcome the obstacles that non-true mates face? It’s no secret that The Phoenix Pack and The Mercury Pack series are one of my favourite shifter series and so of course I look forward to the release of every book that Suzanne Wright writes in this world. And The Force of Temptation was just a good as all the other books. If anything with each new book the series continues to get stronger and stronger. I really loved Jesse and Harley’s story. It was definitely something different from what we’ve previously seen from the other couples but interesting nonetheless. I loved it because it wasn’t predictable but even though I’ve read their story and love it – I’m worried. I’m worried for this couple that I’ve come to love and never want to see torn apart but I can’t help but think ‘what if Harley’s true mate finds her?’ I’m hoping that it never comes to that. I was hoping that Suzanne would somehow make them true mates but that never came but still, like I said, I loved it but I’m just a little worried. Even though most of this series focuses on Jesse and Harley, there is still so much going on within The Mercury Pack compound. They’re being blackmailed by a half-shifter who wants to build on the neighbouring land and also with the extremists on Harley’s case, it’s a dangerous time for any shifter. What I loved most about this book was that Harley was a margay (cat) shifter rather than a wolf shifter. It’s nice to be introduced to other shifter species. I’ve noticed other species have started popping up within the story so I’m looking forward to seeing more from them and hoping it means we could potentially have more spin-off series in the future. Overall, The Force of Temptation is a fantastic read one that any fan of this world will love! I for one cannot wait for more. Thank you to Montlake Romance for giving me the opportunity to review this book in exchange for an honest review. 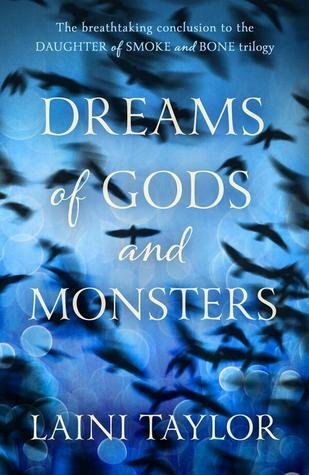 The Review: Dreams of Gods and Monsters is the third and final book in Laini Taylor’s Daughter of Smoke and Bone series and honestly it was a damn good finale! I know I was a little late to the party with this series. Okay I was really late in getting around to read this series but you know what? I’m glad I was because I didn’t have that tortured wait (like most of you had) in waiting for the next release date to roll around because waiting in between these books would have driven me crazy! Ever since I started reading about Karou’s and Avika’s journey I fell in love with their story and I was dying to know how it would all end. Their relationship was full of so much drama and angst, pain and love but most of all hope and hope is the key element of this series. Hope. There is always hope no matter how bleak things look. Admittedly Dreams of Gods and Monsters wasn’t my favourite out of the trilogy – was it me or did this book feel too big? It definitely could have been cut down. Mainly I think Days of Blood and Starlight was such a huge act to follow but anyway, this was still a good way to end the series. It did have a lot of moments where I wanted to pull my hair out especially because Karou and Avika still face trouble being together even at the end. In all, I’m really glad I found the time to start this series. It was a great journey and I’m sad to see these character go. Highly recommend if you love star-crossed lover and fantasy stories. Thank you to Hodder & Stoughton for giving me the opportunity to review this book in exchange for an honest review.